So let's see here... we've got a girl with a tragic past, a rat and a cat fighting each other, an overabundance of shoujo eyes, the Chinese Zodiac and an episode that ends in tears. 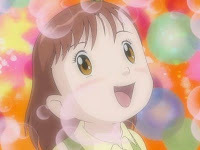 So let's amend our previous statement: Digimon Tamers is now a combination of Lain, Evangelion... and Fruits Basket. One of these things is not like the other. Plus I remember Yuki being a lot more charming than this. At first glance, this seems like a pleasant distraction episode offering a nice change of tone before we return to the heavier stuff again. Everybody's downright silly in this episode and compared to Vajramon and Indramon, Kumbhiramon is a pushover. 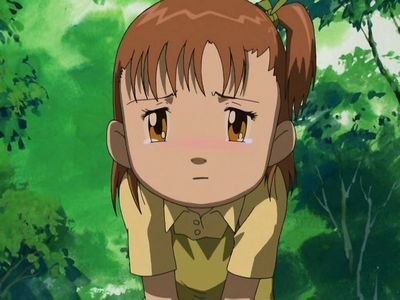 Leomon makes a cameo appearance, Jeri fawns over him in adorable fashion and he leaves before he gets too attached. It has all the makings of a one-shot disposable episode that spotlights the second stringers without doing too much damage. But given what ends up happening later, this is one of the most important episodes of the whole arc. Jeri hasn't made much of an impact so far, falling well below Kazu and just slightly above Suzie on the rank of significance. She is a slightly goofy secondary character, presented as just another friend and potential love interest (which means squat as romance in Digimon has historically been either ignored or thrown together at the last minute). She's been lumped in with Kazu and Kenta as of late and continues to be here as they spy on the tamers holding council, the two boys imagining how cool the job is. Jeri denies interest, but her developing affinity for the card game and attempt to partner with Calumon prove otherwise. Enter Leomon, riding in on a rainbow and scaring away the Deva that was bothering her. It's a hell of an entrance and Jeri is immediately taken, confident that this hunk must be her destined partner. Leomon, who doesn't seem the type to watch shoujo anime, is kinda creeped out by her displays of affection. Let's just say we don't have to wait until next episode to make Kagura jokes. After priceless reactions from all of the Tamers, Gargomon helps Leomon overcome Kumbhiramon's double team attack in a relatively laughable battle. Jeri attempts to help Leomon via modify cards but it doesn't work, further cementing the fact that she's delusional. The end result is Leomon returning some of Jeri's affections (or at least showing pity), but opting to leave before things get any more awkward. 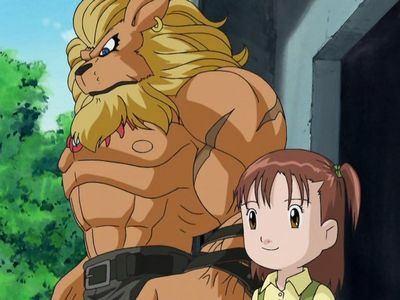 We could ask why Leomon shows up (we haven't seen any non-Deva Wild Ones in a while and they haven't traveled by rainbow in the past), but the lesson of episode nine still applies: when a rainbow shows up, just go with it. What we are left with, however, is a distraught Jeri, who had gotten her hopes up so much that when the rug is pulled out from under her, even when she was the one pouncing on it, she is inconsolable. The others don't even try. Henry, Terriermon and Guilmon make themselves scarce in a hurry. Even Takato, given a prime opportunity to earn serious points with the girl he's eying, ends up leaving. None of them can understand her behavior. How can somebody declare themselves something, act as though it's true despite all evidence to the contrary, then be that devastated when the truth comes out? It's irrational, it's painful to watch and it reveals a disturbing side of Jeri nobody wants to accept. Her final words are “How could I think I was special enough?” The whole episode reveals that Jeri has some serious issues with self-esteem, obsession and a refusal to share her demons with friends. When someone that had always appeared to be a minor character has those kinds of problems, it suggests two things. One- she won't be a minor character for long. Two- whatever her role becomes, it's gonna get ugly. All that time horsing around with Guilmon must have brought Jeri, Kazu and Kenta closer together. She didn't seem all that sociable with the knuckleheads before, but now she's only mildly annoyed that they are literally dragging her into the bushes against her will. We've harped on Yamaki's mad speeches before, but now his talk about being silent guardians of the city is leaving me with the impression that he thinks he's Batman. I don't know whether to be amused or bothered by the way Takato seems to take all this in stride, muttering “that was fun” after the first encounter and relaying Jeri's insane answers over the phone to Henry and Rika. When Henry arrives, Takato says, “about time” as if Henry can teleport from his apartment to this random spot in the park. I would say the stock footage of Jeri using a modify card is a clear indicator that she'll end up becoming a tamer, but remember that we were fooled with that trippy “sucked into dark ocean” sequence in episode 13 of Zero Two. They aren't exactly being subtle with the weird-looking kid, are they? Bad enough that the tamers just accept him watching the battle without asking questions, but now he's cackling and running off when he sees Calumon work his magic. We get it; he's probably a spy. This episode gets even more funny/awkward when you compare it to the manga version, where the fact that Jeri is smack dab in the middle of puberty is quite blatant. "We've harped on Yamaki's mad speeches before, but now his talk about being silent guardians of the city is leaving me with the impression that he thinks he's Batman." Yamaki gets all the cool lines, though! Is it really surprising considering who had a hand in writing the dub script? On a related topic, what was the deal with that Monster Makers scene at the end? They were looking at a picture before the tremor came, but I can't understand why or what it means.